St. Thomas More Church was built in 1980. The church is fairly large and can comfortably seat 500 people. Each side of the church is flanked by five long, beautiful stained glass windows depicting details from the life of our Patron, Saint Thomas More. The sanctuary was designed by Chris and Kristie Hollier and painted by artist Keith Estilette. Numerous contemporary statues adorn the sanctuary and vestibule. 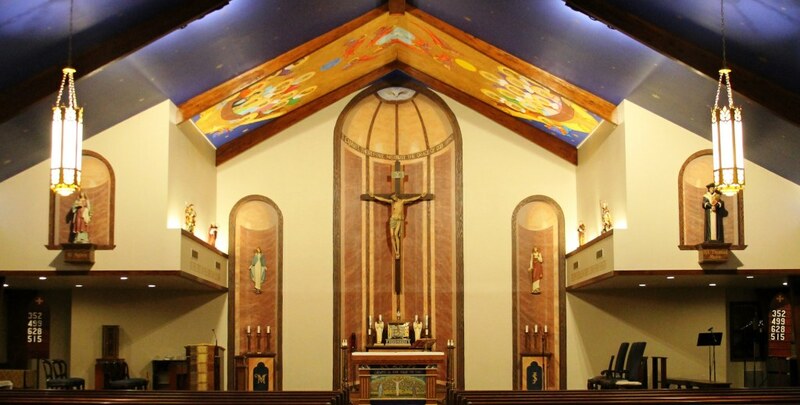 A major renovation was completed in 2016 which included a large, commissioned mural painted by artist, Brian Theriot on the ceiling above the altar and sanctuary, new pews and lighting, new tile flooring with an inlaid mosaic depicting our patron, Saint Thomas More, a new altar with custom inlaid mosaics, and a newly-painted ceiling depicting the night sky - adorned with a multitude of stars on a deep blue background. A spacious Nursery is available for parents with young children to enjoy Mass in comfort. Our 24-Hour Chapel, located in the Administration Building, is a tranquil retreat where visitors may stop by anytime and spend time in quiet prayer with Our Lord. It is accessible either through the Administrative Office or through an outside entrance on the south side of the Administration Building in the Marian Prayer Garden. The Parish Social Hall is a large, multi-purpose facility built in 1987 and is an excellent choice for registered parishioners to host a wedding reception. Having been completely renovated in 2012, the beautiful facility can comfortably hold approximately 300 people and is equipped with a caterer's kitchen and large bar area. The Social Hall may be rented by registered parishioners. Our Social Hall is frequently used, as it is also a place where we hold Family Fun Day, Vacation Bible School, Parish Organization events, bible studies and classes, and Volunteer Socials. St. Thomas More Catholic Parish is honored to share our beautiful facilities with its registered parishioners. 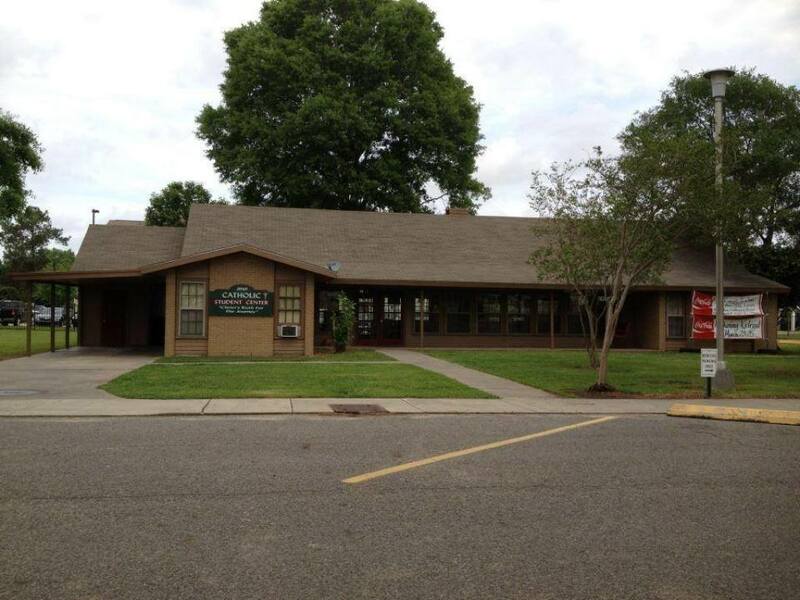 For information about renting the Parish Social Hall, or using any of our other facilities, please call our office @ (337) 457-8107. Caterer's Kitchen equipped with two ovens plus two 4-burner stoves/ovens, a microwave oven, two double-door commercial refrigerators, one freezer, triple commercial sink, and three tray warming table. Our LSUE Catholic Student Center is housed on the beautiful campus of Louisiana State University at Eunice. Located on Center Street, behind the Manuel MX buildings and next door to Bengal Village, the CSC is a great place to meet new Christian friends, get a better understanding of your Catholic faith, and most importantly, develop a closer relationship with Christ. A Eucharistic Prayer Chapel is open during business hours for adoration and prayer. Fr. Clinton Sensat, Pastor of St. Thomas More Catholic Church, serves as Chaplain of the CSC. Joe Nelson is our CSC Campus Minister/Administrator. Weekly Masses are celebrated every Wednesday at noon in the Center, with a free lunch provided immediately following for those attending. There is always something going on at the CSC, so stop by anytime and get to know us. We love visitors!